Outside my window... 99 degrees and my first daybook in San Angelo, TX! And I want to add that 99 degrees is actually cool. It's been 105+ since we got here a little over a week ago. I am thinking... about my tomato plants that needs planting! A family/church friend from Indiana gave them to me when we were in town and I reeeeally need to move them out of those tiny pots and into a proper place. The delimma: I need a place that's sunny but not in direct line of the Texas sun. I accidentally placed them in what I thought would be a shady part all day and they wilted :( But just like Hubby said, they perked right up after watering. I am thankful for... a house that now looks like a home! I just realized this morning that every thing is unpacked and we just have a few organizing left to do. Yay! I am reading... nothing :( Hoping to start reading again after unpacking/organizing the house is done. I am hoping... to have the boxes out of here by the end of the week. I am hearing... Nathaniel playing with his pinwheel. Around the house... boxes; at least they are empty! One of my favorite things... homemade bread. They are happy as they sing that old, sweet song. Sing to me of heaven, sweetest song of all." Hubby begins his top secret class tomorrow; seriously I'm not kidding about the top secret. 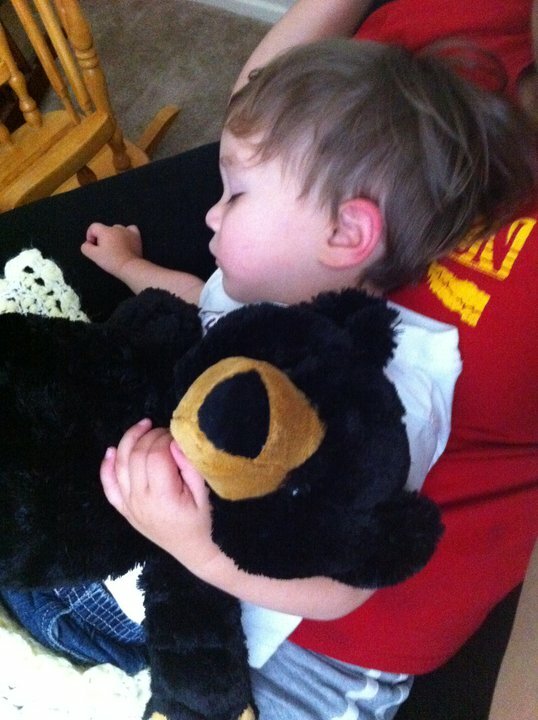 Here is a (iPhone) picture I am sharing... 6.21.11 Nathaniel wanted his bear Mr. Calimlim to nap with us. Such a busy, exciting time putting together a place called home. Happy Day to you! Moving is a big job! Sounds exciting for you though. There truly is 'no place like home'!Precious picture of your little guy sleeping. best wishes with the moving. and WOWZA...could you please send some of that sunshine here...105...wow! that's warm! Following from the Friday hop.